Organizations have always been wary of outsourcing during recessions. While today it delivers cost-reduction to clients in spades (proven emphatically during our recent state-of-outsourcing study), many organizations have proven, in the past, to push it down the priority-list of radical cost-reduction measures, when they fear for their very existence. 1) Outsourcing planning has been at an all-time-high coming off the last economic crash. Many companies have been busily planning to increase the scope of their outsourcing contracts in mature outsourcing areas such as IT, call center and print/document management, in addition large numbers seeking to make first-time moves into emerging areas such as F&A and Procurement (see our recent data). We're also experiencing a shortage of available advisors to help clients with their contracts, with the management consultants and boutique advisors enjoying a strong resurgent in client-demand for advisory services. 2) IT Outsourcing is a proven commodity in today's market and BPO is no longer a daunting or "unique" strategy. During previous economic slowdowns, many companies regarded outsourcing as potentially disruptive to the business, often viewing it as a unique and somewhat risky strategy. However, as the IT outsourcing market has become a mainstream commodity for the large corporations, whose IT management have honed their expertise with managing outsourcers and global sourcing operations, utilizing offshore IT is today a tried-and-trusted cost reduction tactic employed by the vast majority of the Global 2000. Hence, it was little surprise that the leading offshore IT services providers continued to grow their businesses throughout the last downturn. Moreover, while many areas of BPO that posed substantial cost-reduction gains were definitely viewed as disruptive last time out, we believe services such as F&A BPO are now proven mainstream offerings with over 800 organizations having now taken the plunge. 3) A lot of fat was cut during the last downturn - in many cases, outsourcing is the only option for productivity gains. Quite simply, most organizations can only lay-off so many staff over sequential years of tough conditions, until they reach a point where there is no more wiggle-room to find any more costs to shave. You can only request your managers to increase their numbers of direct staff reports so much, and have them take on only so much extra work, until you get to the point of negative returns from your staff output, In addition, organizations are frequently losing their best staff who've been burned out and demoralized during drawn out periods of staff retrenchment. In many cases, outsourcing is the only logical option to open up added resource, and free up your internal talent to focus on adding value to the business, as opposed to plugging leaks. Outsourcing can provide that opportunity to re-energize your top talent, having freed up new resources and eliminated the ongoing cost-pressure. 4) The rise of Global Business Services is encouraging buyers, previously wary of outsourcing, to embed it into their global operations strategies. Our research shows that 90% of enterprises (greater than $1bn revenues) have shared services and 97% manage outsourcing engagements. However, the majority of them have yet to gain from combining shared services and outsourcing into one well integrated management framework, which we term as "Global Business Services". A well-executed Global Business Services strategy is distinctly different from the narrower focuses of shared services and outsourcing, as it identifies corporate objectives and encourages internal functional silos to collaborate with each other and third party service providers to create breakthrough operational capabilities that drive business outcomes (click here to learn more). As more global enterprises grapple with managing these hybrid environments, the more new-thinking we are seeing around aligning shared services with outsourcing. Additionally, when you examine the client strategies of the leading management consulting firms, they are all focusing their client advisory on helping them benefit from Global Business Services; it's no longer about approaching "outsourcing" in a silo, but as an enabling operational lever that enhances a global operations strategy. 5) The realization that we're in an interconnected global economy is forcing the issues. While the last Recession taught us that our global banking systems were all interconnected, the subsequent issues surrounding government debt have reinforced the issue that our economies are intertwined to the point where we have to consider global issues and global resources in our day-to-day businesses. The capability to leverage global skills, less costly resources, data and knowledge via outsourcing partnerships is becoming increasingly valued by business leaders who want their operations to be global. Moreover, the better providers can support rich analytics across global operations, the more valuable these outsourcing partnerships are becoming for many of the maturing clients. Many organizations know they have little choice but to explore their global sourcing opportunities to survive in this environment - and outsourcing has a major role to play. 6) The middle-market is fast opening up. Traditionally, outsourcing of IT and business process has been reserved for the major corporates, who have much larger arbitrage opportunities, and can command the attention of the top-tier providers. However, the middle-market tier, typically those firms with revenues between $1bn-$3bn is now exploring outsourcing opportunities aggressively, particularly with the second-tier of providers being forced to explore smaller opportunities with such intense competition at the high-end. Moreover, our recent research has shown the satisfaction levels within the mid-market are actually higher than those experienced by the high-end - often because they have to offer-up broader process-scope and need to reach an end-state quicker (click here to view our insights about the "Band-Aid" effect). We believe the success of middle-market outsourcing will drive this market forward, especially in light of the tight economic conditions. 7) The increasing availability of new global sourcing locations. It really isn't all about India and the Philippines for IT and BPO services these days. It really is a global market for outsourcing, with significant strides gained from Latin America in recent years and the emergence of the USA and Canada as price-competitive “home-shore” locations, especially for sourcing services that require a lot of customer and business intimacy. With states such as Michigan (for example, read GE's recent announcement) are now proving competitive from a price and talent availability perspective, we believe the make-up of many sourcing engagements are going to involve many broader location options for clients. Moreover, a Double-Dip Recession will only raise the political issues of sourcing locations to new heights, especially with a contentious Presidential election in 2012. 8') The pressure to explore new productivity thresholds by accessing horizontal and vertical "Business Platform" solutions. "Business Platforms" enable customers to leverage business services through subscription-oriented, consumption methods via a business platform that integrates Cloud Computing technology, SaaS and Business Process Outsourcing functionality. Business Platforms aim to provide customers with business services that can help drive innovation, flexibility and cost-reduction, while providing business outcomes to clients. Essentially, providers are looking to business function leaders to bypass their IT departments and acquire "Business Platforms" that are readily available, for example in horizontal areas such as expense management and carbon-management, or industry verticals, such as pharmacovigilance or merchandizing. Today, we're largely only seeing components of broader business functions being supported in the Cloud by providers, but we expect this to accelerate as providers aspire to offer more Business Platforms as they are developed. With intense competition between the providers to push Business Platforms to clients, the greater the pressure on business leaders to run pilots and start exploring opportunities to externalize processes with providers where it makes business sense to do so. We firmly believe Business Platforms are the future of outsourcing, as the worlds of IT and business process delivery continue to merge. A Double Dip recession will surely encourage some organizations to look at more radical, disruptive means to reduce cost and improve productivity, and Business Platforms will provide some options to explore. 9) The career path of the global sourcing executive is fast taking-shape. Sourcing is becoming big business. A few short years ago, there were barely enough executives in the industry to fill a lecture-theater, who were true experts in forging a career out of managing complex outsourcing engagements for buyers. In most instances, the responsibility for managing an ITO relationship fell to the CIO, who tended to delegate most of the PMO responsibility to a direct report. Similarly, the CFO would tend to ask their shared services leads to take over the PMO functions for BPO engagements. At first, many resisted and focused too heavily on administering punitive SLA schedules. However, as outsourcing has become mainstream, ambitious senior IT and business operations executives know they need to have proven outsourcing PMO expertise to be taken seriously for career advancement for many leading corporations. They also know that successful outsourcing is only possible by continuous learning and relationship development with their provider partners. HfS has observed a significant mindshift since the last downturn to approach outsourcing more strategically and recognize the benefits it can bring during tough economic times for their business. The focus on blending outsourcing into global operations and shared services is significantly changing the mentality towards embracing what outsourcing has to offer, as opposed to resisting it. 10) And finally, your views, please! 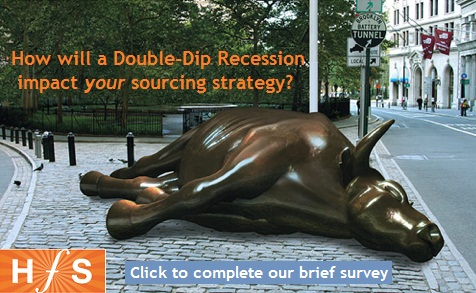 Complete our brief survey to share your views, experiences and intentions of outsourcing with the imminent threat of a "Double-Dip" Recession. All answers will be treated with the strictest of confidence, and you can receive a copy of the study findings. Whether you buy, sell or advise outsourcing services, your opinion is highly valued - please click here to complete the survey. Interesting study - the results will be very telling. Imagine many firms who are far along with evaluation, or are experienced in areas such as ITO / F&A will proceed aggressively but we'll see a lot of the inexperienced firms playing a "wait and see" game. Further to posted comments, I represent a leading outsourcing service provider and historically our portfolio consisted of Blue chip corporations but recently we've been approached by SME's. Many of the requirements are from new start-ups looking to expand operation but unable to afford staff due to ever shrinking margins and stiffer competition. We've had to realign our service offerings to provide relevant services and capture an emerging market. 50 % of CEO's have heard about outsourcing and 5 % are actively pursuing it. 100% of CEO's have heard about it and majority are actively pursuing it. Various chanllenges remain and the industry needs to urgently address overwhelming concerns of quality, service delivery and consistency of service delivery.